Although this blog provides a range of editorial formats, from fantasy to mystery this week alone, it has been sadly deficient in advice columns. Perhaps this is because we have not received a single request for guidance in the mountain of mail that routinely arrives at UNdertheC headquarters, but Dear Abby hasn’t been around this long for nothing. Accordingly, I’ve prepared some completely unsolicited advice for a demographic that just wants everyone to leave them alone right now: college seniors. Every senior in America would like nothing less than for adults to develop a complete disinterest in their future plans, so of course I am going to throw my opinion out there and encourage them to check out AmeriCorps. Like many students who graduated in 2010, I left college with a degree, a summer temp job, and, thanks to the recession, an awareness of economics that I had attempted to avoid by majoring in Environmental Biology. Despite my best attempts at networking and applying to jobs during senior year, it wasn’t until July that I received a job offer with AmeriCorps. For the uninitiated, AmeriCorps is a government program through the Corporation for National and Community Service that places mostly twenty-somethings in year-long service positions across the country. AmeriCorps “volunteers” (so called because the stipend is intended to cover only living expenses) are placed with host organizations and have specific roles within that organization. Most AmeriCorps positions are affiliated with social work. My sister, for example, is currently serving as an AmeriCorps volunteer in Pittsburgh, where she helps at-risk high school students develop job readiness skills. Because of AmeriCorps’ reputation, science students might never think to look into opportunities with the program, and that, dear readers, is a mistake. From September 2010 through August 2011, I served with an AmeriCorps program coordinated by the Conservation Corps North Bay (CCNB), located in Marin and Sonoma Counties, California. Right off the bat, the opportunity to live somewhere completely different is a huge benefit of AmeriCorps. For a Jersey girl who’d spent college shivering in Central NY, the San Francisco Bay Area was a dream come true. It remains easily the best place I’ve lived, and I still have to try to limit the number of sentences I begin with, “When I lived in California…”. Although it’s never easy to move far away, it’s less stressful to do so through a program like AmeriCorps. The coordinating organization can usually offer housing and logistical suggestions, and you can relocate knowing that you’ll have a group of twenty or so built-in AmeriCorps friends- no awkward Meet Up groups! There were about twenty-four AmeriCorps volunteers through CCNB, and they were some of the most motivated, passionate, down-to-Earth people I have ever met. College grads are transitioning from living in a town full of friends to a city of strangers, and I think it is a tremendous benefit to make that leap with a group of like-minded people. From a more utilitarian angle, it’s also an excellent networking opportunity. Other AmeriCorps alums from my year are currently managing exhibits at the Chicago Botanical Garden, running a rain barrel company, and completing environmental education degrees, and it’s great to have friends with complementary careers as I develop my own. CCNB placed two AmeriCorps volunteers each at sites throughout the North Bay. I was at the Golden Gate National Recreation Area (GGNRA), part of the National Park Service. GGNRA is comprised of fragmented park sites ranging from south to north of San Francisco. 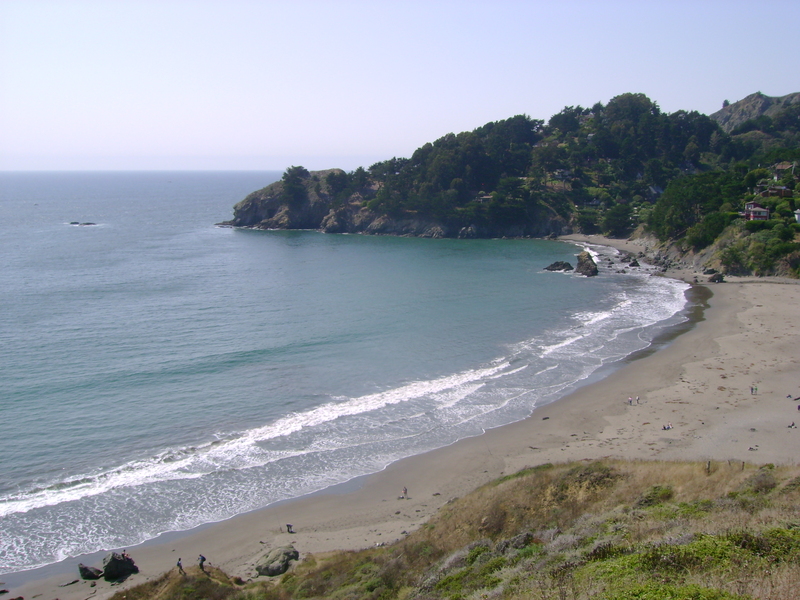 I was primarily based at Muir Beach, which some readers may recognize because it’s just down the road from Muir Woods, the famous redwood forest. Muir Beach was in the middle of a multi-year creek restoration that entailed rerouting the waterway to its original flowpath. (More details to come in a future blog post.) 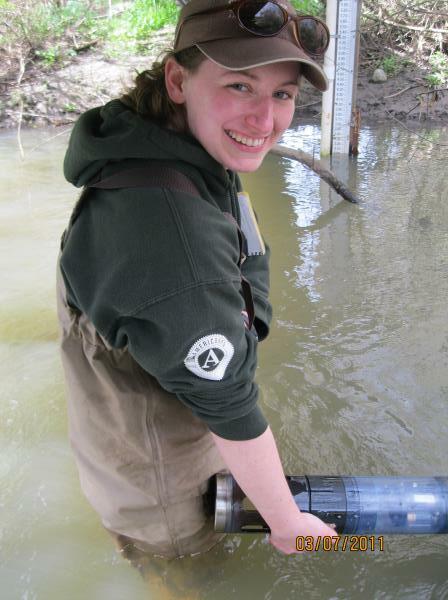 My role was to continue the environmental monitoring that supported the restoration, which meant that I got to spend about 70% of my AmeriCorps hours tromping through the creek in waders. Every week, I would use a hand-held device to record water quality in the creek and at its outlet to the ocean; retrieve, clean, and calibrate the water quality instruments that lived in the stream and recorded conditions hourly; take photos from specific locations to provide a sort of time-lapse visualization of the restoration; and check groundwater depth at piezometers located throughout the floodplain. I usually spent one morning a week at the native plant nursery, taking care of the thousands of plants being grown for the restoration by pruning or sorting seeds or transplanting. And at least a few times each month, there was some major restoration effort to assist with. I spent a few days helping an NPS electrofishing team perform salmonid surveys, helped plan the (extremely muddy) installation of new piezometers, walked along yards of transect tape identifying plants for a vegetation survey, and led volunteers in planting native seedlings in Muir Woods. If I ever got bored of Muir Beach, I could just scoot across the Golden Gate Bridge, because part of my job also required me to keep up with water quality monitoring and tide gauge data at the Presidio, located in the northern part of San Francisco. Would you believe this frog pond was only one year old? Restoration is amazing! You may feel as though I’ve tricked you into reading my cover letter, but there’s no quick way to describe everything I did as an AmeriCorps volunteer because I had the privilege of doing so much! Every day was different, and it was largely up to me to plan my own schedule to complete all the monitoring and data entry. 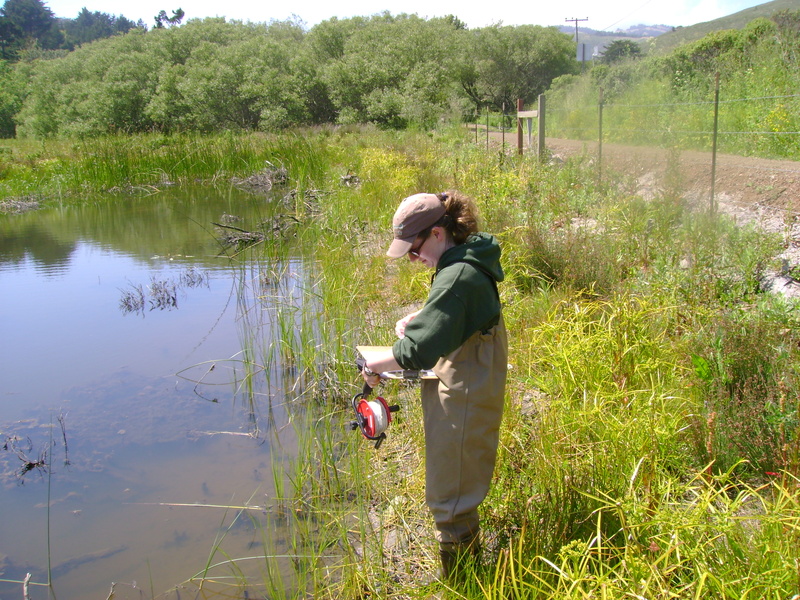 I was never on my own though: I had two formal mentors (an NPS Wetland Ecologist and Project Manager), one informal mentor (the native plant nursery manager), and the AmeriCorps supervisors back at CCNB. These people provided technical training, answered millions of questions, and encouraged me to participate in park efforts not directly related to my list of responsibilities. AmeriCorps volunteers are expected to develop a variety of hard and soft skills as they give back to their country in service, which is a distinct difference from a typical job that requires one to excel within the limits of the job description. And, not for nothing, an AmeriCorps internship could translate into a more permanent position. I worked for the Golden Gate National Parks Conservancy after my AmeriCorps position ended, and at least a third of the volunteers from my year were hired by their placement sites. So college seniors (or recent grads looking to escape the cubicle maze), consider checking out upcoming environmental opportunities with AmeriCorps! (www.americorps.gov) And for everyone else in desperate need of marine science advice, you now know where to send those Dear Abby letters! If any readers have questions, please feel free to drop them in the comments or email me (contact info on the About Us page). I’m happy to answer anything about my experience with AmeriCorps, working for the NPS, living in the Bay Area… this is obviously a topic I enjoy discussing! And a disclaimer- I am not currently an AmeriCorps volunteer. The opinions written in this post are strictly those of the author. This post is not endorsed by AmeriCorps or the Corporation for National and Community Service, and does not reflect any official position on their part. Tags: AmeriCorps, restoration, science jobs. Bookmark the permalink.